A promo code or in other words a coupon code is a code which is used to getting a discount on a particular commodity. In the coupon code, a percentage discount has been set by a retailer, which you can avail during online shopping. For, e.g., If you want to buy an iPhone from a particular website, who is providing 10% discount on a purchase of every iPhone, then by using its promo code say “IP10” you can get 10% discount on your subtotal. In Snapdeal, you can easily use its promo code to avail great discount. Just have a glance at this article to know how to use snapdeal promo code. Step 1: First go to the snapdeal official website “www.snapdeal.com” and then click on “Login” button, which is at the top right corner of your screen. Step 2: In the next step you need to provide your email address and snapdeal login password and then click on the “Login” button. 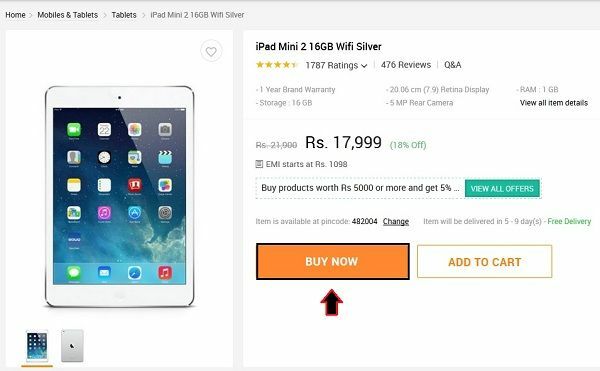 Step 3: Now, browse the product which you want to buy and after selecting an order, just click on the “Buy Now” button, as shown in the image below. Step 4: In the “Review Order” step, you can easily apply your promo code. Just click on the “Have a promo code?” option, as marked in the image below. Step 5: Here, you need to enter your promo code and then click on the “Apply” button. Step 6: Once your promo code is applied, then you can continue with “Place your order” option.